Why set up your company in France? Warehouse for rent in Saint-Quentin for crafts or industrial activities. 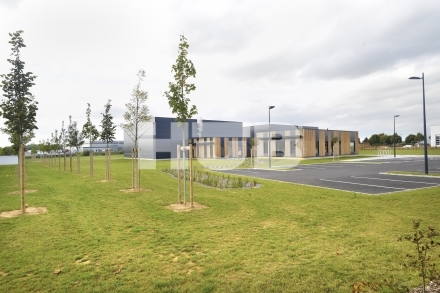 Warehouse with optical fibre in northern France, only 2 hours away from Lille, Paris and Brussels, within the Business park “Parc des Autoroutes”. Warehouse for rent in northern France. Commercial real estate in France. Business leaders, are you interested in this offer? Within the Business park “Parc des Autoroutes”, less than 2 hours away from Lille, Paris and Brussels, this modern and innovative warehouse with optical fibre will satisfy all your ergonomic, technological and architectural requirements. Double skin metal structure with wood cladding for the offices. Warehouse for rent in northern France. Commercial real estate in France. Minimum surface: 520 m² (400 m² workshop and storage room + 120 m² offices), maximum surface: 1,000 m² (850 m² workshop and storage room + 150 m² offices). Rent price of the warehouse in Saint-Quentin: 40 €/m²/year. Regional trains, tramway, metro < 20 min. A free service to help you setting up your company: business areas, land, premises, offices in France and abroad.